Aidan Baker has done it again: pulling together a brace of collaborators to form a perfect triangle, See Through is a magnificent sum that’s greater than the parts, showcasing the way relinquishing individuality in favour of collectivism can yield something… other. And See Through is decidedly other. The press release describes the process, an evolution and layering: ‘The project was brought to life through Baker exploring textural rhythms created by sampling small, sharp and abrupt sounds on the electric guitar and then sequencing them in a drum machine to form the bedrock of the tracks. 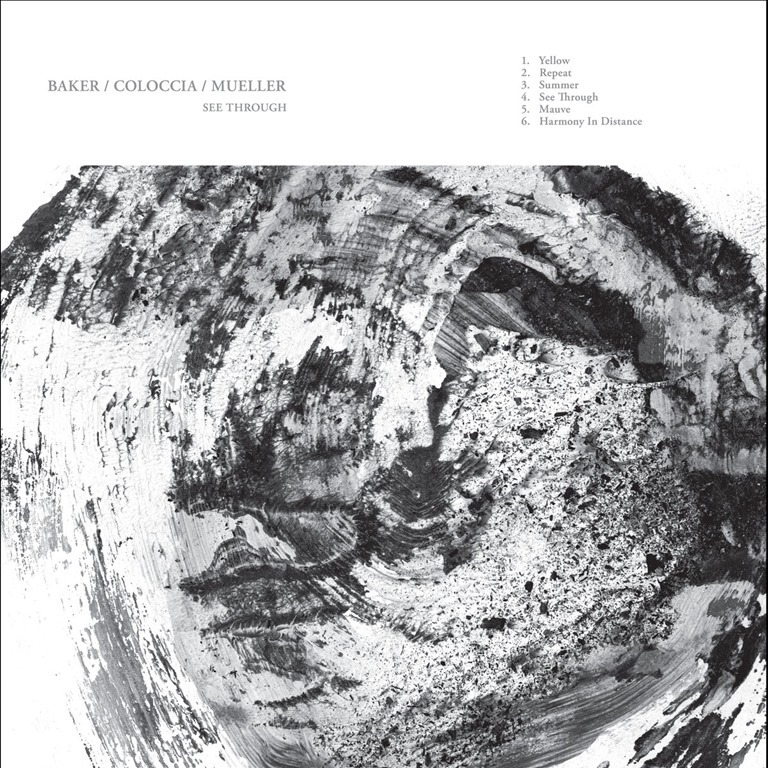 Mueller then added his particular, signature brand of intricate, hypnotic percussion to the mix and the compositions began to grow and take shape. The pair agreed that the pieces needed a more human touch and Coloccia was invited onboard, contributing processed vocals via looping, tape manipulation and microphone feedback. To describe it as ‘ambient with beats’ – a phrase I’ve used to describe worriedbaoutsatan, who sound nothing like this – may be vague, but it’s accurate. It’s all about the slow build… and the percussion. Starting with higher-pitched finger drums, it evolves to a polyrhythmic experience. Insistent tribal drumming hammers a martial beat that underscores wraith-like vocal echoes and soft, supple surges of abstract ambience… the effect is mesmerising, hypnotic. Snaking hints of the exotic twist through the hazy infusions of the sprawling eight-and-a-half-minute ‘Repeat’, which finds the percussion dampened, dulled, yet no less insistent as it clumps and clatters along in the swirling sonic mists. See Through is an album of evolution, and the tracks seep into one another to form a cohesive but ever-shifting sequence. As is the case in respect the album as a whole, the percussion is key, and changes between each piece, backing off and rising to the fore once more. ‘Summer’ takes a more ambient direction, the beats subdued and submerged, muffled and distant and pulsing through a viscous, subaquatic density, before the title track ventures deeper into darker territory, an unsettling, shifting rumble that shudders and shuffles, suffused with incidental scrapes and vaporous drones which creep in and out of the frame like ghosts, like drifting mists, like so many intangibles. It’s dark, uncomfortable, disorientating, and extremely difficult to pin down -which is precisely its indefinable source of both its appeal and its artistic success. It builds to a scraping crescendo around the 8-9minute mark. The final track, ‘Harmony in Distance’ wafts drifting ambience over a soft rhythm that builds in intensity, until the soft sonic washes and drifting vocals give way to a rising thunder of drums that drive the album to a tidal climax.